Following the death of Margaret Thatcher, I found myself thinking frequently of UB40’s great song about her, “Madam Medusa,” from their first and best album, 1980’s Signing Off. Their later pop successes with “Red Red Wine” and “I Got You Babe” often overshadow their much heavier and more serious early work. The cover of Signing Off is an image of the band’s namesake, the “dole card” that recipients of unemployment benefits in Britain had to carry to get their benefits. The band said at the time that it gave them millions of card-carrying members from the day of their formation, in the dark days of Thatcherism, the Falklands war, race riots and Reagan’s election in the U.S.
1980 was the year of Sandinista!, the Clash’s last great album, and their magnificent 12″ dub singles. Bob Marley gave us his last album, including his career farewell, “Redemption Song.” In the US, David Bowie released his last great album for at least a decade, Bruce Springsteen followed up Born To Run with two discs of dark and thoughtful songs, Dead Kennedys released Fresh Fruit For Rotting Vegetables, and Talking Heads released their greatest album, Remain In Light. And John Lennon and Yoko Ono started over and ended too early. UB40 ended up being lumped in with that crowd, but while the two-tone bands were reviving the 1960s, UB40 was writing genuinely British roots reggae, in the spirit of their Midlands predecessors, Steel Pulse. But while they continued the fiery political tradition, UB40 put aside Rastafari and the Bible and wrote for their secular British peers. “Madam Medusa” is a terrifying tune that perfectly captures the impact Thatcher had on Britain. Alongside songs like “Burden Of Shame, “Tyler,” “King,” and their cover of “Strange Fruit,” it is as much a document of its time and place as “Catch a Fire” was of early 1970s Kingston. Almost thirteen minutes long, it opens with a organ bubble beat, a killer bass line, and the words. “From the land of shadows, comes a dreadful sight / The lady with a marble smile, spirit of the night.” Brian Travers answers every line with a heavily reverbed sax. “From the tombs of ignorance / Of hate and greed and lies / Through the smoke of sacrifice / Watch her future rise.” With controlled fury and bitter wordplay (“Her tree of evil knowledge / Sprouts a special branch”) that must have made Peter Tosh proud, they dissect her mercilessly, Ali Campbell’s mournful vocal contrasting with Astro’s frenzied toasting (“Run for your life before she eat you alive / Move out the way cos you blocking out the day”). It and “Burden Of Shame” were the only songs whose lyrics were printed on the album’s inner sleeves. But this record from the 1980s speaks to the here and now in a way the hit singles don’t. The speculators still prance in the bloody footsteps of her successors in Greece and Italy and Cyprus, and we all still prefer to ignore our own burdens of shame. If the construction scaffolding around your very expensive apartment building had blown apart in medium winds a week ago, and you knew that a tremendous hurricane was on the way, wouldn’t you make sure the scaffolding was properly secured before the storm hit? Apparently not at One Hanson Place, where such pedestrian concerns seem to be far beneath the notice of the residents and management of this lofty building, surrounded this morning by debris and police tape after the scaffolding came apart again last night. 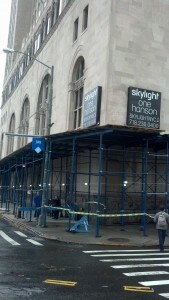 One Hanson Place is the former Williamsburgh Savings Bank building, the tallest building in Brooklyn, which was converted into condos costing upwards of three million dollars. 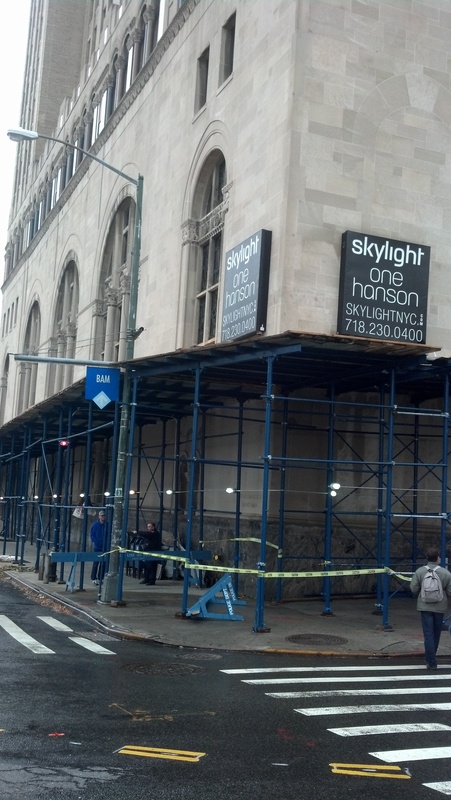 Ten days ago, on Saturday the 20th, I was walking down to the Brooklyn Academy of Music when a number of the corrugated metal sheets covering the scaffold blew off. They nearly hit me and a few other pedestrians, and badly damaged several parked cars. I’m sitting in the Winter Garden as Steve Reich’s Six Pianos fills the space around me. No delay or reverb effect can match the sound of a piano note traveling 500 feet, hitting glass or stone, and returning. Reich’s pieces mutate slowly and powerfully, and in this space the change happens in stages, with the new patterns arriving on top of the melded decays of previous patterns. Six grand pianos, almost 1,400 strings, weaving and interlocking into a pattern as intricate as the network of struts that support the glass panels of the ceiling. Notes seem never to die, but instead to live on among those glass panels, and the leaves of the transplanted palm trees that die every few years. When the dynamics swell, the attacks are piercing and the music surges like the tide; when the music softens you can almost feel it tugging at your feet. If there’s been any consistent theme to my own fitful musical explorations of the last year, it’s been delay. (Including delaying the playing of music at all, sad to say.) Sometimes notes are so beautiful you don’t want them to go away; this weekend I did a piece that in its unedited form was almost 20 minutes long, but probably contained less than 30 seconds of playing. Every note was captured in a loop, which was then captured in another lop, and another one, and in between and within every loops were many different delays, most of which mutated the sound on each iteration. The music literally takes on a life of its own. And with as many delays and loops as I usually use, the interactions are not always predictable and the music can quite literally go off in a direction that was never intended. In the case of this most recent piece, I enjoyed the initial direction (what I’d started out meaning to do) much less than I liked the decaying and decayed result after untold numbers of loops and mutations. Sometimes these pieces are so long simply because I get lost in listening to them; the slow changes as the loops intersect and decay are as endlessly interesting as waves on the beach. “Is anything ever going to happen? It’s already happening. In fact, you might have missed it wondering what was going to happen. Following the Reich performance, a DJ performed, remixing some of BOaC’s work. It was lovely; he explored the same kinds of changes and mutations, but I can’t see myself ever working like that. I’d rather start with an empty space than move someone else’s furniture around. The piece of mine I’m discussing is Parsing Priests with Perl, and the second half that I like better is Parsons, Priests and Pearls. Both were inspired by my workday Friday, during which I converted a few thousand bylines from a religious magazine from unstructured text to formatted “author” objects, using the programming language Perl. I did the conversion by parsing a large text file containing all the original bylines. Generally you do this in a series of nested loops; you go through the lines of a file and break them into components, then loop through the components, sometimes processing them into smaller components. The improv piece is also a series of nested loop: the innermost one is various brief harmonica phrases, the next one is an analog delay with a filter and a ring modulator in the feedback loop, then there’s another loop with a variable filter around that, which in turn feed into two long double-track loops. The performance consisted of playing the various phrases into the first loop, and “playing” the filters, the modulation and analog delay’s feedback control. All performed live, with me playing not only the role of musician, but also of producer (changing the music after it had been played) and audience (listening to, being surprised by, and not always liking the results). 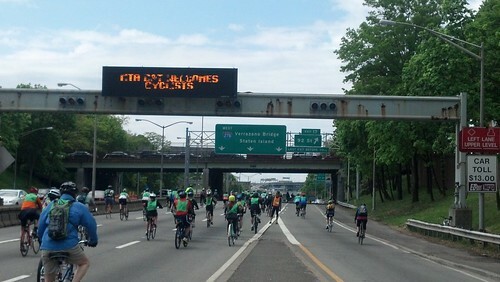 I rode in the Five Boro Bike Tour for the second (and last) time today. 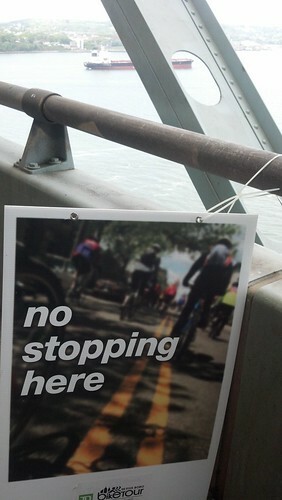 The 5BBT is the bicycling equivalent of St. Patrick’s Day, but it does have one unique feature: you can ride over the Verrazano Bridge. 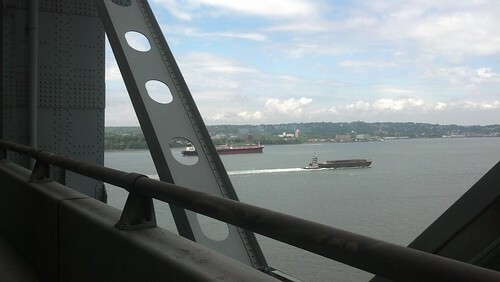 The bridge and I are roughly the same age, and I think it’s the second-most-beautiful bridge in the city (the Brooklyn Bridge of course being first). Several years ago, I rode in the tour on a miserably rainy day, starting properly at 7am in a mob of bicyclists so thick it took 15 minutes before I could actually ride rather than walking. The crowds were awful, we ran into frequent traffic jams, and when the mob stopped entirely on the Gowanus Expressway, in the chilly rain, I bailed out, got off at the Second Ave exit, and rode home. I did not make that mistake this year. I ignored my 7:45 start time, instead leaving the house at 9:30 and heading down to Dumbo, joining the tour 3/4 of the way through, just before getting onto the BQE. It was a beautiful day, the ride down the BQE and Gowanus was great (and also faster and less stressful than driving), and I did get to ride over the bridge, even stopping (illegally) to take some photos. Thursday night I went into Soho for my weekly rehearsal with the Antelope Dance Project and Prince Street was full of news vans and police trucks and barricades. And for once, it was something real — not a movie, not the NYPD showing off for the tourists a terrorism-response drill, not a wildly inappropriate response to a political protest. 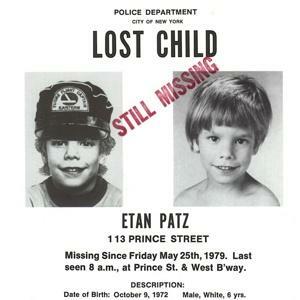 They were digging in the basement of the building on the corner for the body of Etan Patz. Nobody else at the rehearsal remembered that name, but I don’t think anyone at the rehearsal lived in NYC then. Most of them weren’t even born when he disappeared, back in the spring of 1979. I was about to graduate eighth grade, and I didn’t pay much attention to the news. But that summer, his bucktoothed smile and blond bangs were everywhere. I suspect that quite a few non-white kids who weren’t the children of artists disappeared in NYC in the 1970s, but he was the one who made the news, the first one to have his picture on the milk cartons we looked at over cereal, the one who grabbed the attention of a sheltered 14-year-old kid in Staten Island. Soho has changed so much since then. That was the year I first started going into Manhattan by myself (and kudos to my parents for allowing it, in that atmosphere). I would go to the Compleat Strategist on 33rd Street, or Baird Searles’s Science Fiction Shop on Eighth Avenue (past all those nice women on 14th Street who always waved hello), or to the pre-superstore wonderland of Barnes and Noble on 5th and 18th, or to the Strand. But I didn’t go to Soho. Why would I? There was nothing there, just long dark streets. Even years later in college, I thought of Soho mainly as the somewhat risky last-ditch place to park when you couldn’t find a space in the Village. And now? A few weeks ago I got to rehearsal and realized I needed batteries for my recorder. Just outside the studio on Wooster Street, there are plenty of stores selling high-end handbags and shoes, although that night only one was open, and that for some kind of reception for overdressed anorexics. But no real stores, nothing for normal people living normal lives. I had to walk three blocks, past West Broadway (where Etan’s bus stop was), to find a deli where I could get some batteries. Thursday night I sat in the pre-rehearsal circle with the dancers, and talked about how it felt to run into that story from my childhood again. Had he lived, Etan would have been older than everyone in the room except for me. He might have had children going to school themselves. We concluded the circle and the dancers began their warmups. I usually play for the warmups, not the music I play for the show, but a completely in-the-moment improv. This is what I played Thursday night, thinking about a little blond boy and long dark cobblestone streets, about this piece of history jutting into shopping-mall Soho, surrounded by tourists and shoppers staring back in time at a world they had never seen. "We got a lotta lotta lotta hard work today ... we gotta rock at the government center ... "
The New York Times today has an article on an endangered building, a landmark example of a classic school of architecture that some people want to tear down. But the style of building represented by the Orange County Government Center is, in the view of many people including me, notable mainly for its ugliness. Aptly called “Brutalism,” it theoretically discarded facades and pretense in favor of exposing the actual building itself, the concrete and steel that held it together. It also tended to discard traditional forms, breaking buildings up into groups of boxes. Brutalism and I are peers; it’s about the same age as I am, and we grew up together in many ways. I spent years working in the hideous main building on Dow Jones’s South Brunswick campus, a bizarre construction of overhanging concrete boxes and pillars, and grew up playing in and around the Society of St Paul building in Staten Island, although perhaps that’s a bit too fanciful to be considered truly Brutalist. But as a child of the late 60s and 70s, I grew up with a lot of unrelievedly ugly crap — polyester leisure suits, platform shoes, progressive rock music — so I don’t have a lot of nostalgia for the cultural tropes of my childhood. We may have grown up together, Brutalism, but I don’t like the way you’ve turned out. So, should they tear down the Government Center? Isn’t that bizarre design just perfect for a “Government Center”? There’s nothing else like it anywhere in Orange County and certainly not in Goshen, a sleepy little Victorian town that I used to drive through when I worked for Ottaway Newspapers in nearby Campbell Hall. Should we work to save these buildings? At first, I thought, hell no. It’s hideous and it sticks out like a sore thumb in an otherwise rather pretty downtown. Then I thought, this exact kind of thinking led to the destruction of Penn Station — it’s old, it doesn’t fit in, it’s standing in the way of progress. And then I think, Penn Station was breathtakingly beautiful and would be a wonderful landmark if we still had it today, so much better than the current rathole and the beyond-hideous Madison Square Garden (public architecture enemy number one on the Times’s list of buildings that should be torn down). If Orange County were to spend money it doesn’t have to fix up and renovate the building (it’s currently abandoned; like many of these structures, it was always leaky and was damaged in Hurricane Irene), would people in the future thank us for it? Or would they wonder why we bothered? I had one of those awful moments earlier today. I had left my microphone plugged into my pedalboard last night (never a good idea), and since I use an XLR-to-quarter-inch impedance transformer, that means about four inches of solid connector sticking straight up from the pedalboard input. Which of course, I tripped over, destroying the transformer, breaking off its 1/4″ plug, and leaving the very tip of the plug jammed all the way down into the jack socket. And I have a rehearsal tonight. No time to take the pedalboard apart and replace the jack, even if I had a spare jack which I don’t, and in any case all my electronics and soldering stuff is up in Ithaca. 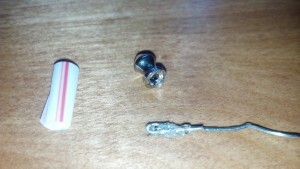 So I searched around and found this article, which addresses the much more common problem of breaking a plug off in a 1/8″ stereo jack like that on a laptop or an iPod. The best suggestion there involves using a pen refill or the straw from a juice box, but that won’t work with the larger 1/4″ jack. Plus, the larger jack has larger springs. When you plug into a jack, there are spring-loaded metal tabs that press against the plug and hold it in place. There are several of them including one that fits into the groove in the tip. So you can’t just reach in and pull the tip out — it’s too hard to get a grip and you can’t overcome the force of the spring without a very firm grip. So I followed the other, riskier suggestion. I got a soda straw and cut off about an inch, then slit it up the side. I rolled it tight, inserted it into the jack, let it open up, and pushed it down firmly until it was right up against the broken-off tip. (See photo.) Then I straightened a paper clip and squeezed the end into a loop that would fit into the hole in the plug tip. I mixed up some epoxy, got a good glob of it onto the paper clip, and inserted it into the jack and pressed it into the hole in the tip. The soda straw ensured that no epoxy got into the jack itself. I held the clip there for thirty seconds or so, then left it to harden for three hours. Now here’s the extra step that you probably wouldn’t need to do for a 1/8″ jack. The top-most spring tab in the jack was no longer being held back by the body of the plug, so if I had tried to pull the broken tip out, it would have hit that tab and probably fallen right back in, leaving me back where I’d started. You have to hold that tab out of the way as you pull out the broken tip. So, with a pair of pliers in my right hand, and an awl (looks like an ice pick, with a screwdriver-style handle) in my left hand, I got to work. I used the awl to hold the spring back, grasped the paper clip with the pliers, and pulled. The plug came free, and between the awl and the soda straw, came out smoothly. The epoxy let go at the very end, so I had to fish the broken tip out of the jack with the awl, but the aforementioned spring tab prevented it from falling back in very far. Pedalboard is fine, and fortunately, I do have extra microphone adapters. I was about to start work on another song for February Album Writing Month when I noticed that my chromatic harmonica was buzzing badly on one hole. When this happens on a regular blues harmonica, it’s usually just a tiny piece of dirt stuck in a reed. Nine times out of ten you can fix it very quickly. But a chromatic is an entirely different animal. This is the big harmonica with the button that you see jazz and classical players use. It’s essentially two harmonicas in one; unlike standard harmonicas it has both the “white keys” and the “black keys,” and you switch between them by pressing the button. With the button out, you use one set of reeds, and with the button in, you use an entirely different set. They’re also harder to play, so most chromatics include small valves, or “windsavers,” that block off the reeds you aren’t playing. They’re basically just small strips of plastic that get sucked or blown against the reed plate to block off, say, the blow reed when you are playing a draw note. These valves get stuck sometimes, or damaged. They’re very delicate, and the slightest rip or tear, or even bend, in them, will affect your playing. The buzzing usually indicates a dirty or stuck valve. Thanks to Winslow Yerxa’s excellent tutorial, I was able to clean them properly without damaging them. I took a few photos to illustrate the process. 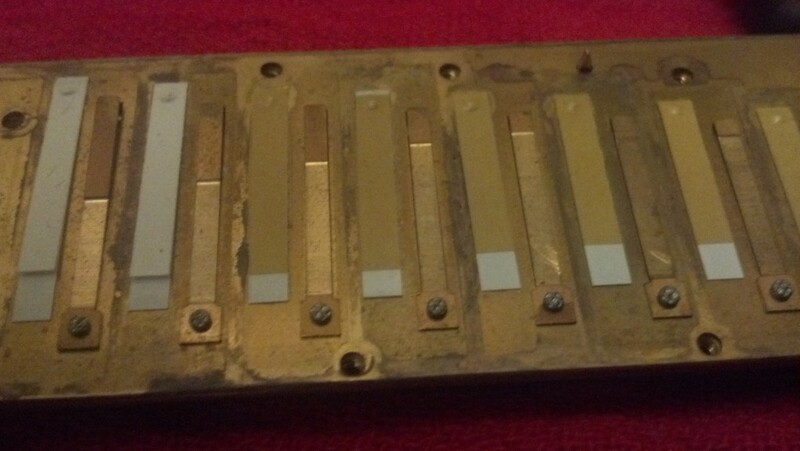 Here’s the chromatic with its cover plates removed. 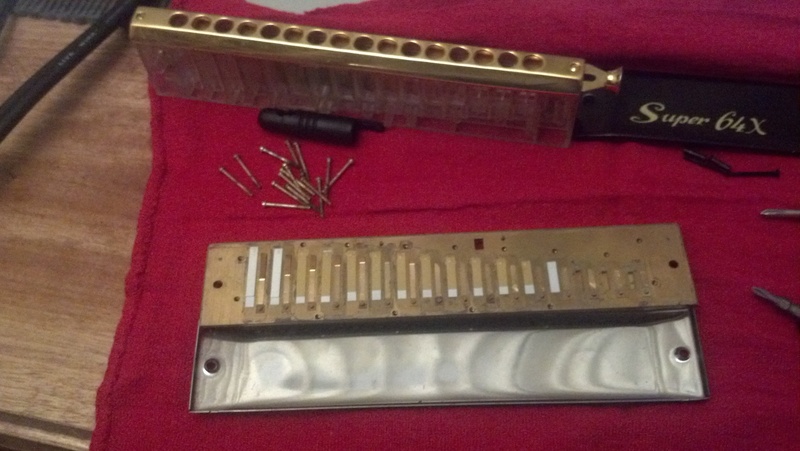 The next step is to remove the reed plate from the comb; there are fifteen small screws to be removed around the perimeter of the plate. The reed plate has now been removed from the comb, and is resting on the lower cover plate. You must be very careful not to damage the reeds and valves on the other side of the plate while working. Closeup of the valves and reeds. 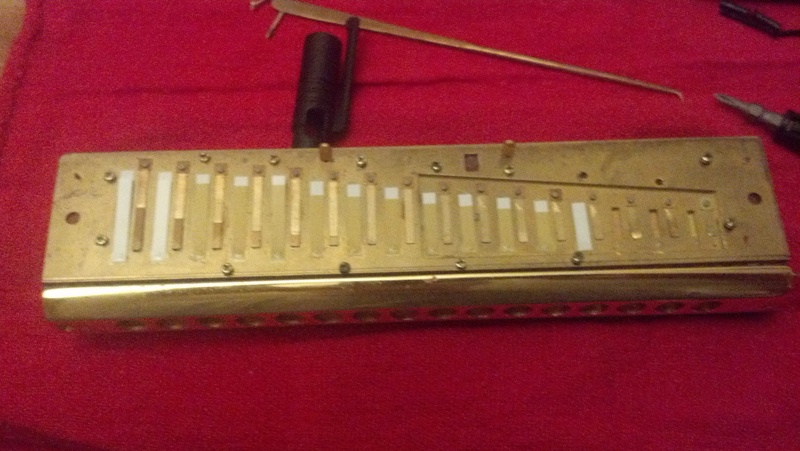 The reeds are the brass strips with the rivets, and the valves are the brown-and-white strips next to them. There are two reeds for each hole in the harmonica; you see here the pairs for seven holes. We are looking at the inside of the bottom reed plate, so the exposed reed is the blow reed. When you blow air over the reed and its neighboring draw reed, the valve will be blown down against the plate, blocking the draw reed, so that all your air goes over the blow reed. There is an equivalent valve on the other side of the plate beneath the blow reed. When you draw, that valve will be pulled against the reed plate, blocking off the blow reed, and the valve you see will be lifted up, allowing air to flow over the draw reed. The cleaning process Winslow describes works perfectly; read his post for the detailed description. You basically use a bit of cleaning material (he suggests a piece of brown paper bag, cut to just slightly larger than the valve, dipped in water) to clean between the valve and the plate, and between the two layers of the valve (the white layer, which is soft and adheres to the plate, and the beige layer, which is stiffer and serves as a spring to return the valve to position after it operates). iPhoned for about 18 hours the other day. iT was iRritating and iHated it, so iReturned it. iWill never do that again. Some background. Over the Christmas break I lost my iPod Touch, which is more or less an iPhone without the phone. It’s an expensive device and since it can only connect through wi-fi, the “find my iPod” function doesn’t work if it’s not online. So I decided that having a smartphone (my Droid) and another expensive electronic device just for music-playing was overindulgent.